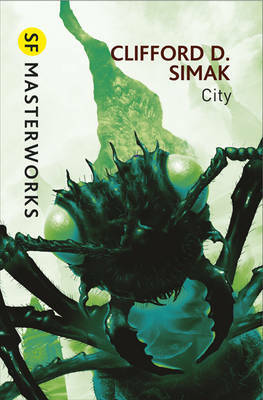 American writer Clifford D. Simak's City is a notable example of the "fix-up novel": a series of formerly independent, although similar in some aspects to the others, narratives that are meshed together by some sort of framing element to make a quasi-novel out of short fictions. At times, these "fix-ups" work well: Walter M. Miller, Jr.'s A Canticle for Leibowitz perhaps is one of the best-known and loved examples of this. However, there can be weaknesses that crop up when forcing short fictions into a larger whole. Sometimes, narrative energy is dispersed and the creaky edges of each individual story segment reveal quite clearly the spot welding applied to the narrative seams. City unfortunately is less than the sum of its part. City is divided into eight stories woven together with short framing sections. Stretching over 12,000 years, from the then-near future (the 1990s) to a distant future in which sentient, speaking dogs have replaced humans as the dominant mammalian species, these stories explore issues of longing for peaceful interaction. Humans fade away over the course of these stories. They leave their earthly burdens for a transfigured life as Lopers on Jupiter. It is a quietly depressing theme, one that is borne out over the course of these stories. There is a museum-like quality to these narratives. Oh, not the purposeful type, as is quoted above, but rather there is a sense of withdrawing, a placing of human achievement off to the side, at first to be admired by progeny that have left the crumbling tumult of cities for a simpler, more pastoral life. One such family, the Websters, are seen at various points over the course of these stories, along with a near-immortal mutant and a robotic servant. As the stories progress, a quiet sense of despair becomes apparent. Here, escape is idealized - humans leave Earth for a paradise, at the cost of their own humanity. The dogs are left to battle with sentient ants, with a further increase in a sort of entropic torpor that persists until the final epilogue appears to sputter like a dampened roman candle. For some, these stories build up one another to create a rather damning commentary on human life and our propensity for dreaming even as we obliterate all that we supposedly hold dear. There is something to that, as there is that growing disillusionment with the waking world that is present throughout the generations of Websters and those associated with them. Yet many, and I am one of them, will find themselves dissatisfied with it. The stories feel muted, robbed of potential narrative power because there is no conflict when one side just surrenders and fades away into oblivion. This is only compounded by the herky-jerky nature of this particular fix-up. With only a few recurring characters, there is little connecting these stories. By the time one reads 25-30 pages, one story has faded and one gets to experience another iteration of Simak's theme of disillusioning escapism, only with other characters. There is no sense of depth here, likely due to the lack of apparent conflict or narrative tension. The simplicity of the narrative/societal fade to black has as its downside the lack of narrative energy; what's the point of caring about any of this when it is clear from the very beginning that there is so little to do other than to shrug one's shoulders? City may have held an appeal for those readers from the 1940s-1980 that read these tales, but today it is hard to laud a work in which the theme is rather stark, the characters mere ciphers, and prose that is merely serviceable. There is little to recommend it to those who want something more challenging than a simple capitulation to extinction. It is a work that may intrigue some, but it lacks anything in the way of narrative energy that would leave readers pondering its message long after the final page is turned. City is merely a competent work, not anything worthy of being preserved for future generations of SF readers. It is one of the weakest choices in the SF Masterworks series. One of my favourite narratives. Very endearing. Not entirely capitulation to extinction, though. For humans, anyway. Dogs? Well, the idea is that they will "find their own way." Naive, like "websters" can be. Certainly bespeckled with Simak's pessimism (particular in the social context of the aftermath of WW 2 and ensuing nuclear armament). This is where I think you may have "read it wrong." It is Simak, so the prose is minimalistic, rather than serviceable. "Extinction" opposed to human development - as the introduction eludes to, more about "inner space." "Peaceful" conclusion, clearly pacifism, with an unspoken (naive) view of co-existence with the ants implied by Jenkins final thoughts? If they don't fight and kill one another, understanding can be brought forth? I love this work, worthy of classic status. Yesterday I finished this book. Every time I read this book it becomes more beautiful. Together with A choice of gods and way station it belongs to the best SF has to offer. The slow tempo, the human caracters and universal questions of the important issues makes me return year after year to Simak. There are no answers of justice in the books. Just pleasure. After reading your post, I am looking forward to this. plz keep going and I am looking forward to your next post. I disagreed with, quite literally, everything you said about this book. Did you just read the sparknotes or something?